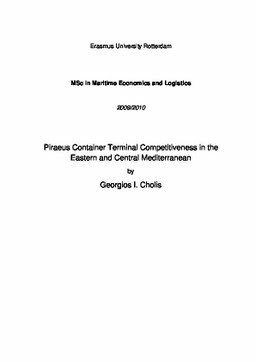 Our thesis focuses on the competitiveness of the Piraeus container terminal in the eastern and central Mediterranean region. More specifically, our analysis consists of the nine biggest container ports (in terms of cargo volume) in an inter-port level. Unfortunately, due to severe lack of available statistical data we could not include in our core analysis, if the selected ports operate in the transshipment or the getaway market. In order to reach the desired conclusions, the thesis has the following structure. At the beginning, we present the necessary literature in order to identify which are the crucial factors, which influence the competitiveness of a container port. Later on, we define which are the available methodologies for the identification and measurement of inter-port competition. Before proceeding with the core of our analysis we defined our market and selected the ports that we will study. Later, we take under consideration elements which influence the demand (in terms of TEU‟s) and the supply side of the E. & C. Mediterranean port industry (e.g. cargo handling equipment). We analyzed those elements in an attempt to pave the way for our core study. In the beginning of our main analysis we identified the port competition in the East and Central Mediterranean Sea by classifying nine ports into four homogeneous subsets. The first subset represents the lowest (average) cargo volumes and the fourth one the highest. With the help of the one-way ANOVA analysis and a post-hoc test (Tukey's honesty significant difference) we concluded that the port of Gioia Tauro ranked first (subset 4), Port Said and Marsaxlokk ranked second (subset 3) with the rest of the ports following. These conclusions are based on the cargo volume data for the years 2003 to 2009. In a second, more analytical effort, we used a model that has been proposed by Dr. Michalopoulos in 2006. This model measures port competition and determines the market position of ports by using a remarkable number of variables. It is based on the benchmarking technique and we came to the conclusion that the port of Gioia Tauro is the leader port, while the port of Piraeus is clearly below the average in the eastern and central Mediterranean Sea. Finally, we came to the conclusion, that through the investment plans and strategies of both terminal operators, the container terminals of Piraeus will create the appropriate conditions for a positive shift in competitiveness.